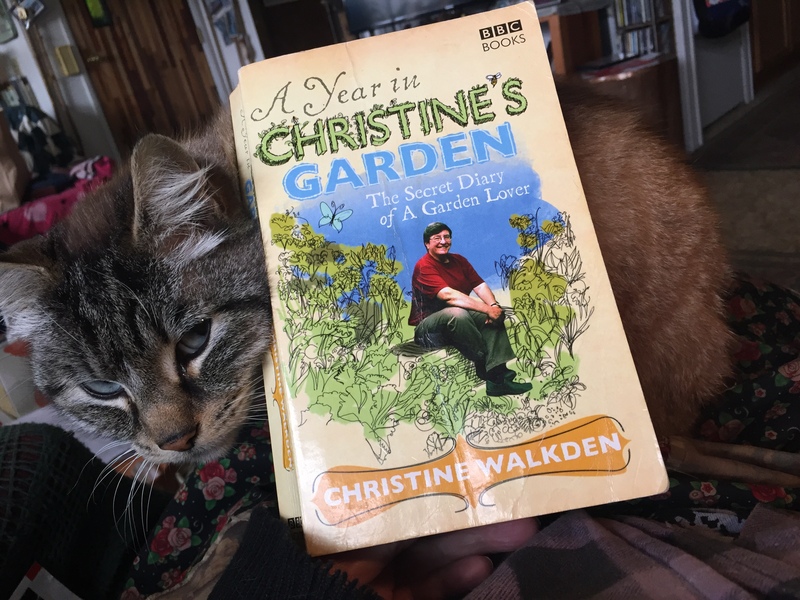 I resisted the lure of watching Gardeners’ World on Inside Outside TV in order to have the joy of reading Christine Walkden’s memoir in one sitting. I had become smitten with her when I saw her on The Great British Garden Revival and then watched as many episodes as I could find (less than half, I am sorry to say) of Christine’s Garden. I loved her memoir even more than I thought I would. She told them, in tears, that she was a private person. I cannot even imagine being in such a pickle! 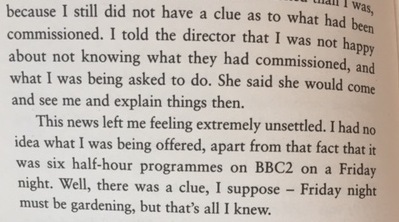 Finally, the camera crew won her trust and she writes that she knows she is “not the easiest person.” How I loved her for all of this! This is what makes the tracking down of the episodes of the show or ordering this book from the UK well worth while. I had wondered if she had gotten picked on for her looks, looks which I adore, of course. Later, she was asked to wear make up and have a hair stylist for a cover of the book. She did not. Christine is also a teacher with a solid education behind her and years of experience. I wish I could have learned from her; I wouldn’t be an amateur with imposter syndrome. I concluded that I am still not mixing my compost together well enough. 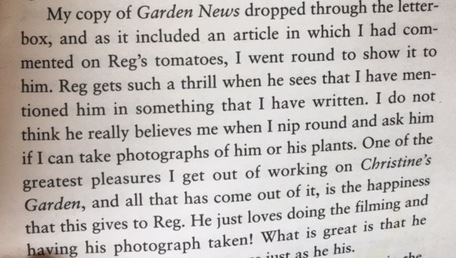 It was a treat to read about her various gardening jobs. In the course of work and garden visits to friends, she mentions some shrubs that I often do not see mentioned in print (Stachyurus praecox and Escallonia iveyi!). A running theme is her gardening neighbours (an enviable situation), especially Reg. Another theme that deeply affected me was her thoughts about her 14 year old dog. I know that Tara is gone by now. I do hope Christine found another dog as fine. And she loves books and has hundreds (or was it thousands?) in her house. She lecture-tours all over the country. Her discourse on hotels is the way I feel and is one of the reasons I am not going to Hardy Plant study weekend this year. I wish to make an alpine trough that uses exactly the same plants as Christine’s. Then I would feel a connection to her every time I admired it. Sometimes, rarely, I find a book that I want to carry around in a hug after I have read it. Christine’s memoir made me feel that way. I want to be her friend. If I could afford to buy a house on her block, I would be wistfully lurking around her vicinity hoping that she would take me in to her circle of gardening neighbours. Christine Walkden is, I think, obscure on this side of the pond. Her shows and her books will repay your for the effort of finding them. Even though I cannot find an official source for videos of her show, you can find some of Christine’s Garden on YouTube and a complete set of her Glorious Gardens from Above garden tour show can also be found on Tubi. I wish I had seen this series as I am finding it hard to find them anywhere. They are not that old. I am interested in the book though and it is available on Kindle, but are their pictures? If so I would go for a second hand copy. Keep up the good work, I really enjoy your posts. There are photos inset. Allan found me a rather battered used paperback. 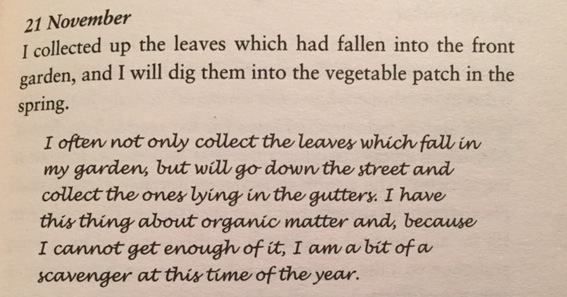 Christine Walkden sounds like a terrific gardener and person. I can see why you’d want her as your neighbor. She sounds like a “genuine” person. By that I mean she doesn’t wear a facade nor is she pretentious or full of herself nor is she a fool who hippity-hops from one garden trend to the next. When I lived in Austin, like you, I also wished for other gardeners of like mind to pal around with and exchange ideas, but I never found any despite joining various garden clubs. Now that I’ve moved and become a master gardener, I have a huge number of gardening friends who are generally terrific folks. I’m blessed. Your gardening friend situation sounds wonderful. I do have gardening friends, just wish I had one within a block or two. You are so right about genuine Christine is. It’s easy to imagine being her friend. I have put her book on my must read list. From what little I have been able to catch her on youtube, she is the perfect gardener. I hope that BBC gives her another show, should she desire it. I won’t get into what constitutes celebrity and recognition, but suffice it to say it involves the wrong calibre of people. Cool. Her diary writing is conversational and honest. I have a new garden boat that is going to bear her name. I enjoyed your review of Christine’s memoir and will track down a copy to read. Christine does indeed have another dog now called Willow. She mentioned her dog a couple of times on Gardener’s Question Time which is a radio program that is available for download for free through iTunes. They rotate garden expert panelists on that show and it is always fun when Christine is on the panel because she tends to liven things up! I also love it when Pippa Greenwood is on the panel.